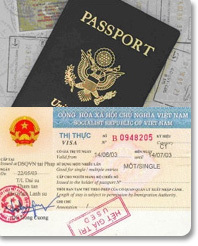 Many travelers believe that they can obtain a Vietnam visa directly at Vietnam airports without applying for an approval letter. No good can come from this since it is not true at all. You may be ended up with the delaying or cancelling of your flight or you have to search everywhere on the internet to find an online agent to give you a rush visa. As a result, we strongly suggest that you should apply online for your approval letter at our website in advance so that you can pick up your visa at one of three main Vietnam international airports (Tan Son Nhat airport, Noi Bai airport, Da Nang airport). We would like to stress the point that Visa on arrival is only applicable for those who travel by air. In other words, there will be no visa on arrival at the border. So if you travel by any other kinds of transportation, you can’t get this kind of visa. In case you don’t enter Vietnam by air, contact us in advance to ask for procedure of getting a visa by land. Many applicants fill in the Application form with WRONG details: full name, passport number or date of birth. Normally, no serious problems come from this. However, you might get trouble at the departure airport if the information on your approval letterdoesn’tmatch those in your passport. Therefore, entering everything correctly and carefully is the best way because it not only takes you just a little time but also prevents you from getting unexpected problems. 4. Arrival date:you as well as so many other travelers may think that the visa validity starts from the date a traveler enters Vietnam, not the date he or she provides in the application form. However, it is not true at all. Please be aware that your visa validity commences from the date you provided earlier, not the date you will enter Vietnam. It’s our suggestion that you should make a clear plan about the date you will enter Vietnam before deciding to order a visa for your smooth trip. 5. Visa extensions:most travelers have the belief that it is easy to extend a visa so they don’t pay much attention about which kind of visa they must choose. For example, if they are not sure about how long they will stay in Vietnam, they can apply for a 1 month visa first, after that they can extend their visa if they have to stay in Vietnam more than that period (as they think extending visa process is simple and fast). However, please note that it is not as easy as you think it is supposed to be. In fact, extending a visa may cost you much expense and time-consuming too.